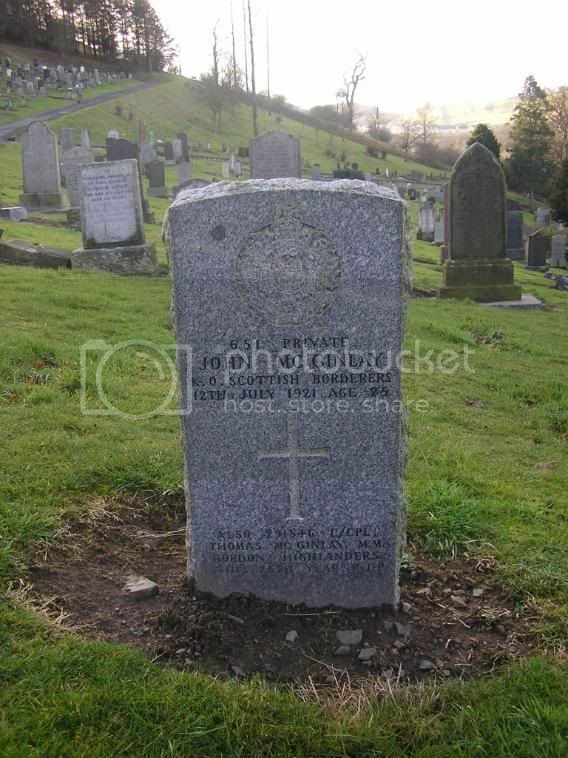 The Scottish War Graves Project :: View topic - McGinlay grave query - one for oor Jamie? McGinlay grave query - one for oor Jamie? Posted: Thu Feb 28, 2008 5:39 pm Post subject: McGinlay grave query - one for oor Jamie? This is the grave of John McGinlay in Hawick's Wellogate Cemetery. Secondary Unit Text: transf. to (234558) 458th Bn. Additional information: Son of John and Grace McGinlay, of 17, Trinity St., Hawick. Born at Hawick. A medal Index Card survives for Thomas confirming his service number. But there is no mention of him on the CWGC website. So did he die during the Great War? Or did he die afterwards and his parents had his service details inscribed on the other brother's headstone? But if he died at home later why isn't his grave next to this one? I guess that he was buried in the same grave as his brother (?) and the inscription added. I understand that CWGC allows this in cemeteries that they don't own. I have a few where a widow, son and in one case a mother have been buried in the same grave and added to the CWGC stone in the same way. I had already come across the CWGC entry so it was interesting to see your photographs. No connection with my branch of the family though. I had no idea the clan had reached as far as the Borders. My name is Tim McKinley. I am 65 years old and I live in Tampa FL, USA. I am a relative of John McGinlay. Last year, I did a research project to learn all I could about my paternal ancestors. I found official records - birth, marriage, death and census abounding, tracing my Scottish roots from John McGinlay's death in 1921 back to his great-parents' arrival at Hawick from Cavan (?) Ireland ca. 1849. I am seeking members of the family who can share whatever they can. Besides the documents, I have nothing of a personal nature, such as letters, newspaper articles or anything else, that would add some color to their story, and show what kind of people they were. I would be most happy to explain how the family, beginning with John's grandmother's brother James McGinlay, came to America and how they grew and prospered.